Kim Danahy runs, but she often likes to go for a swim or a bike ride beforehand. That's right, Kim is a triathlete. In fact, she is now an IronMan. Kim competed in and completed Lake Placid Iron Man this year. From figure skating to road marathons with some stops in between. 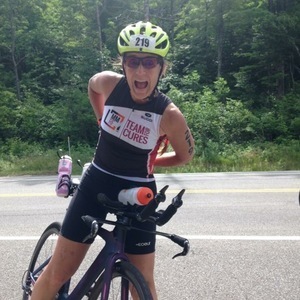 Kim often finds herself swimming, cycling and running for a cause, contributing to the community and competing for those can't. Chris's 2 miles at the YMCA Tri! Josh Stratton LMT - A licensed massage therapist who knows the treatments that runners need. Located in Winton Place. Tell him you heard the podcast and use the code "Poseidon" when booking during September for $15 off a 60 minute massage! They are having their Grand Opening Party all week. Stop in for one or all of the events and let'em know you heard about it here. While you're there, pick up a fancy Podcast shirt. Check the Facebook page or the event link for all the details. A running store located on Mt. Hope Avenue in College Town focused on being a social hub for runners. RRC offers free group runs, and a cool place to hang out. Additionally, their Facebook page is full of hustle and bustle with many pop up runs or running related activities constantly being discussed and organized. Stop in and let'em know you heard about it here. While you're there, pick up a fancy Podcast shirt. A licensed massage therapist who knows the treatments that runners need. His office is located in Winton Place. Tell him you heard the podcast when booking for $15 off a 60 minute massage!